I fell in love with the camera as a child when I saw how my father's use of his Brownie could turn an ordinary day into a family adventure and I have been a lover of the power of photography ever since. I know that a picture tells a thousand words and that you can't put a price on the value of happy memories or the power of a positive image. 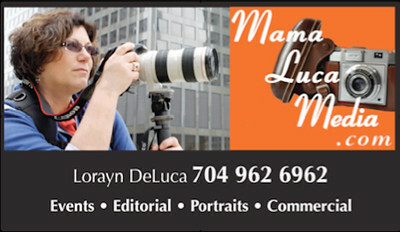 After being awarded the Mayor's Scholarship to study Human Resources Management and Photojournalism in New York City, managing a portrait studio in Hawaii, Off Broadway & Film Actor, HR Operations Executive turned Charlotte entrepreneur, Board HR Chair Turning Point Domestic Violence Shelter, Board Member Monroe Tourism & Development, I am privileged to call myself a Lifestyle Visual Artist. That's why I was humbled to spearhead the Help-Portrait Carolinas Project, bringing professionals together to treat abused women and homeless families to a day of beauty and photography. I was grateful to recruit make-up artists, stylists and photographers who donated their time to give a much needed boost in self esteem to a group in need of a faith lift.Filming a documentary for the Micro Loan Program in Belize so that locals can start their dream business was a heart warming experience. I am honored to be the recipient of the "American Red Cross Real Heroes Award for selfless consideration and extraordinary contribution to the public", Union County Chamber of Commerce Ambassador of the Year Award, UC Chamber Business Woman of the Year Award, TownPlanner Calendar International Best Cover Award, Guild of Charlotte Artists Best Photography Award, AMG Best Freelance Visual Artist Award, Elevate Lifestyle Best of the Best Favorite Actress Award. As stated in American Town Heroes publication, "She has the kind of spirit and heart that helps make a house a home and a town a community. It is not in her nature to sit idly by if there is a way she can contribute to making lives a little better." ***Focused Visual Artist equipped with a calm presence in fast-paced situations. Blends in easily while photographing large events to produce candid and natural shots. •	Photographed high-quality images for social media and press distribution promotional usage. •	Performed advanced computer processing of images for assignments. •	Defined and recommended detailed solutions to capture images. •	Shot photographs on film set and field environments. •	Archived photographs on computers and servers. •	Photographed high-quality images for social media and press distribution promotional usage.